(Nanowerk News) Researchers have, for the first time, been able to track the movement of an electron in a molecule in real time and have demonstrated that these processes can be controlled - in the future this will make it possible to directly control the progress of chemical reactions and biological processes and obtain a desired result literally at the touch of a button. The findings of the study have been published in the prestigious scientific journal Science ("Measurement and laser control of attosecond charge migration in ionized iodoacetylene"). The authors of the study, experimentalists led by Prof. Dr. Hans Jakob Wörner from the Swiss Federal Institute of Technology (ETH Zurich) and theoreticians from Russia, Denmark, Belgium and Canada, including Oleg Tolstikhin from MIPT, are investigating what is known as "attophysics"- the study of events with attosecond time resolution, i.e. a billionth of a billionth of a second (10-18 of a second). Using methods of attophysics, the researchers are trying to track the ultrafast movement of electrons in molecules, or more precisely the restructuring of their electron shells. These processes are the key to understanding chemical and biochemical reactions, as it is the "redistribution" of electrons that is involved in the formation of new chemical bonds. The group led by Wörner previously conducted a series of decisive experiments demonstrating the possibility of such observations, and now the researchers have succeeded in taking the final step: they have actually tracked the movement of electrons with a time resolution of 100 attoseconds, and demonstrated that they can be controlled. "The study observed the migration of electrons along a linear molecule. We were able to see, for the first time, the movement of electrons, how it all happens, in detail. In addition, we demonstrated that this movement can be controlled, and therefore, it is theoretically possible to control the outcome of chemical reactions," said Tolstikhin, Chief Researcher and Associate Professor of MIPT's Theoretical Physics Section. In the experiment the researchers used molecules of iodoacetylene (HCCI), which are elongated chains of four atoms - hydrogen, two carbon atoms, and an iodine atom. 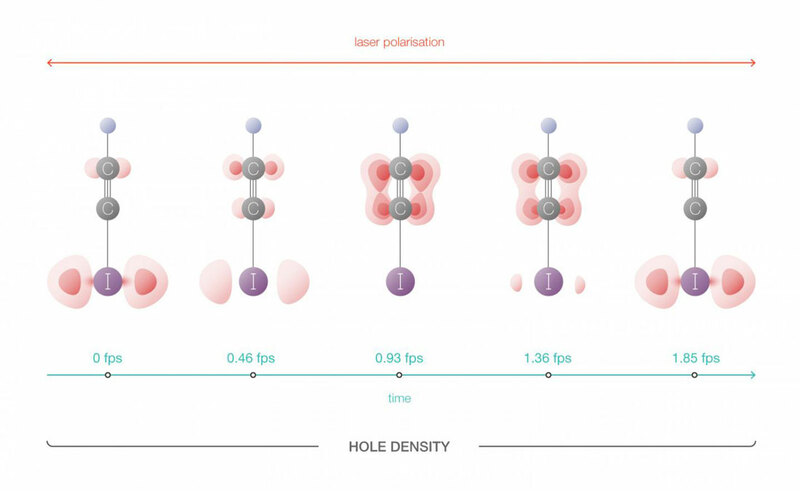 Under the effect of powerful and very short laser pulses, the molecule's electron shell configuration changed: a "hole" appeared - a shell vacancy which then began to oscillate moving from one end of the molecule to the other. Tolstikhin emphasizes that it is not movement in a literal sense, as in classical physics. "As a result of tunneling ionization in a strong laser field, a superposition of two quantum states of the hole occurs: it is similar to Schrödinger's cat that is simultaneously alive and dead; in this superposition the hole can be found at opposite ends of the molecule at the same time. The probability of finding a hole at either end oscillates over time, which is what creates the effect of the hole migrating along the molecule. The hole moves from one end to the other and the characteristic time taken for this movement is approximately 100 attoseconds," says Tolstikhin. By irradiating oriented molecules with powerful laser pulses, the researchers were able to obtain high-harmonic spectra reflecting the state of a molecule's electron shell. In this experiment, the researchers were able, for the first time, to obtain a full set of data, including the relative phases of harmonics required for restoring hole dynamics. The theoreticians' task was to isolate information about this dynamic from the data obtained, and learn how to decipher the spectra, just as astrophysicists use the Doppler shift in a star's spectrum to measure its speed. "In reality we are observing not the position of the electrons, but rather the high-harmonic spectrum which occurs during the process of interaction between a powerful laser pulse and a molecule. Using these spectra, which are indirectly linked to the movement of the hole, its position can be restored, which is what we have done here," says Tolstikhin. In addition, by altering the laser polarization, the researchers demonstrated the ability to influence the dynamics of the restructuring of a molecule's electron shell using a laser field. "This is what will ultimately allow the outcome of chemical reactions to be controlled. If you have a mixture where chemical reactions can result in different outcomes, you can, by choosing the required pulse shapes, select the desired outcome," says Tolstikhin. According to Tolstikhin, an international group of researchers is very common and typical in modern scientific studies. The synergy of knowledge and experience of the five groups of physicists from different countries is exactly what enabled the team to achieve its goal.